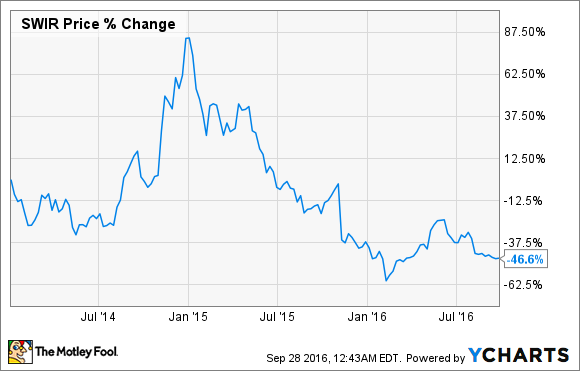 Are Shares of Sierra Wireless a Value Trap? Worried about getting burned if you buy the stock after the last quarterly report? Those fears may prove to be unfounded. The value trap: All honest investors will say they have been caught in one. What looked like a high-quality company at a no-brainer purchase price quickly turned into a money-burning nightmare. Shares of Sierra Wireless (NASDAQ:SWIR) took an 18% tumble last month, after the company reported earnings, and have been unable to mount a comeback after reaching all-time highs in 2014 and 2015. Is the company now a bargain or a value trap? Sierra Wireless builds 2G, 3G, and 4G wireless solutions for connected devices. The company is seeing its hardware getting used in all sorts of applications as the Internet of Things (IoT) gains momentum. With virtually everything from consumer goods to industrial products getting hooked up to the internet these days, Sierra Wireless might seem like a no-brainer purchase after the latest round of investor pessimism has lowered its price. Management expects to see solid revenue contributions from new manufacturing programs from new and existing clients. However, signs of softer short-term demand are cropping up. Existing business is slowing, and new clients aren't turning into new revenue as quickly as originally thought. As a result, revenue increased 9.4% from the first quarter of the year but fell 1.1% from the same quarter a year ago. Given the softer short-term outlook, the company also updated full-year 2016 revenue and profit, and now expects it to be below the low end of its previously stated guidance. New specific numbers were not given, but the previous range was for revenue between $630 million and $670 million, and earnings per share between $0.60 and $0.90. Shares remain down after the downgraded outlook in August. Investors looking for a bottoming out in prices before jumping in could be disappointed. Without any specific numbers from management for the months ahead, share prices could rebound quickly or they could continue to fall, depending on investor's feelings after the next few quarterly earnings before the end of the year. However, rather than try to figure on the absolute best price to purchase shares, it's important to look at the bigger picture. What does that look like for Sierra Wireless? Though short-term guidance was given a haircut, Sierra Wireless management reiterated it is excited about longer-term prospects. With some estimates that the number of connected devices will more than triple, to over 20 billion, by 2020, it is easy to see why the company feels that way. The company backed that feeling up by acquiring GenX Mobile during the last quarter for $7.8 million. GenX Mobile makes vehicle cellular devices for the fleet management, asset tracking, and transportation industries, and complements Sierra's existing business in the space. This is a follow-up to last fall's acquisition of MobiquiThings, a France-based IoT company, to expand Sierra's reach in Europe. The business plan is to continue actively looking for other acquisitions that support the device-to-cloud strategy and that help accelerate growth. Moving beyond the haze that has become the second half of 2016 for Sierra Wireless, 2017 could be a much-improved year. The company continues to add new clients, although it is playing its cards close and not releasing too much information on that front yet. And while revenue for the year is on track to come in lower than it was last year, even the reduced guidance for the next two quarters still implies sequential quarterly gains. There could be some pain left in the tank for Sierra Wireless shareholders, but the company certainly does not look like a value trap over the long term. One very positive sign that all will be OK in the end is the company's cash flow situation, or cash left over after operations and expansion efforts are paid for. Free cash flow continues to rise by leaps and bounds, and has doubled multiple times over in the last few years. 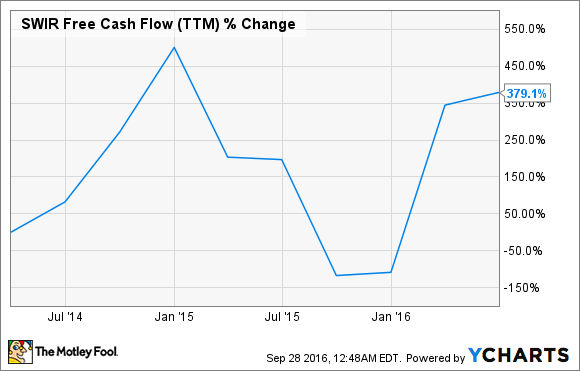 SWIR Free Cash Flow (TTM) data by YCharts. That extra cash is a big reason a small company like Sierra Wireless is able to make acquisitions like the GenX Mobile purchase. It also enables the company to weather lean times, as 2016 is shaping up to be, and helps efforts to expand over time. Even if the going gets tougher in the months ahead, I think it would be unfair to call Sierra Wireless a value trap.